Money money money. Whether you spend a bunch or save it all, it’s a topic we all have to deal with in some way. If you Google something along the lines of “how much money is enough,” you’ll find a bunch of articles about total net worth, financial independence, and early retirement. 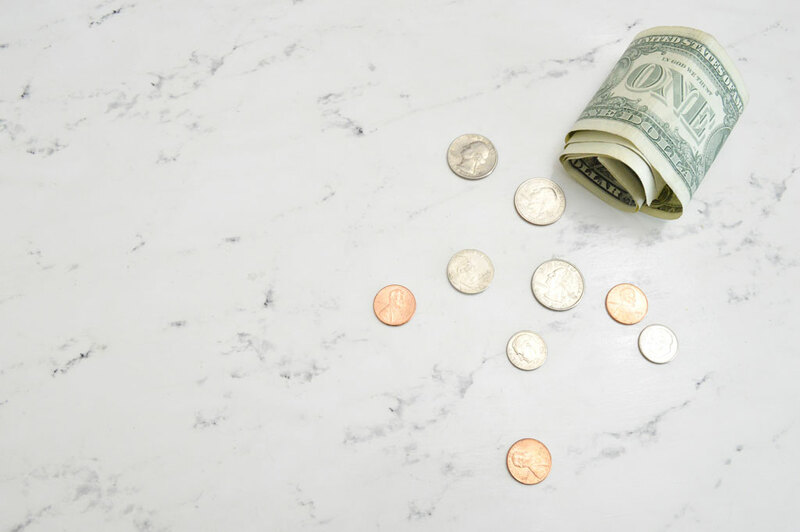 You’ll also see the vague answer, “It’s up to each individual person to decide how much is enough.” While that’s subjectively true, what does research say about enough money? In the previous post, we looked at the data on average American annual expenses. But, what about annual income? As you’ll see based on the research, money can actually buy happiness and well-being—to a point. Where do diminishing returns and turning points occur? What is enough, and can there ever be too much? 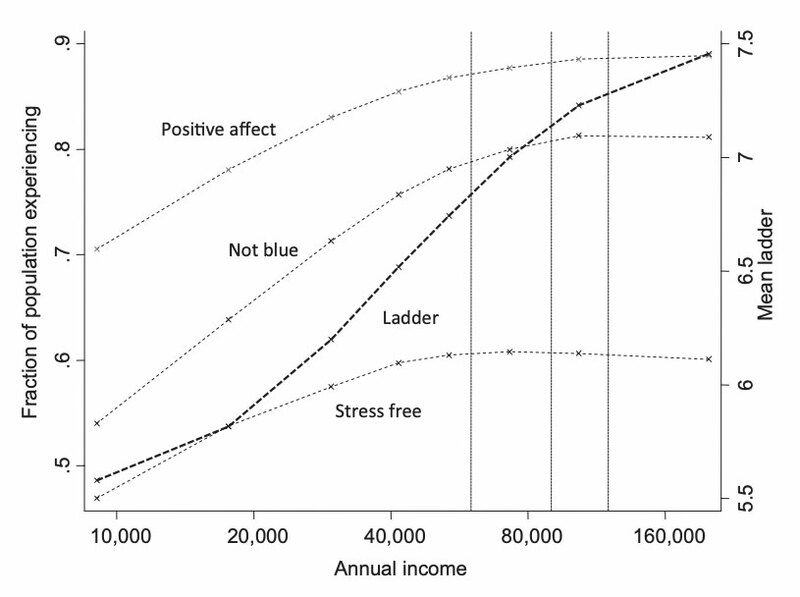 Let’s start with the primary piece of research on this topic: High income improves evaluation of life but not emotional well-being² by Daniel Kahneman and Angus Deaton (published in 2010). 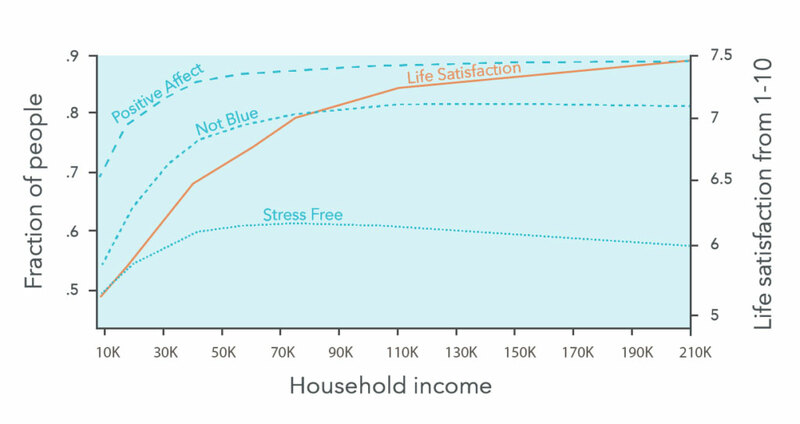 The key findings from the research were that money can keep buying life evaluation (satisfaction) up to any amount, but money only affects emotional well-being (happiness) up to an annual income of ∼$75,000. It’s hard to believe that 2010 was almost a decade ago. Lucky for us, some more recent research was published in 2018: Happiness, income satiation and turning points around the world5 by Andrew T. Jebb, Louis Tay, Ed Diener, and Shigehiro Oishi. Why were their results lower? The research presented in this post shows that we are all subject to certain universal laws of well-being. There are minimums and maximums when it comes to making money. The goal is to figure out what is enough for you. You can take some inspiration from those in the FIRE community (Financial Independence Retire Early) who often have household annual spending in the $25-40,000/year range. This is well under the average annual American household spending of $60,060 in 2017. Will MacAskill (31 years old) has pledged to donate everything he earns over ~$36,000/year to effective charities. Have you determined the “enough point” in your life yet? If so, please let me know in the comments!